I used a cake pan for the cake and followed the directions on frosting it from other cake pictures. For the propeller I cut off the tails of a Swedish fish and squished them together. For the stars on top I bought a simple star candy mold with red candy melt aways. This cake was for my grandson’s first birthday. My daughter designed it from other cake pictures and helped me make it. My son drew the pattern. The wings and tail pieces are hardened fondant. Cut them out at least a week ahead. 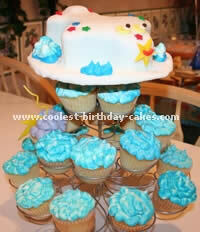 Insert toothpicks in them for attaching to the cake and allow them to dry. The "oneway" is a cut up cake done with two 3" by 10" pieces. One 10" piece is cut in half and laid across the bottom with the other half laid across the top (and a small triangle cut off to create the angle). It is covered in fondant. 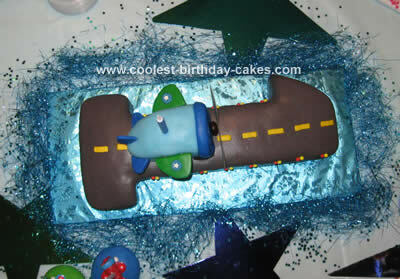 The airplane cake is baked in a mini loaf pan. Fill the pan at least half full of batter. Do not cut off the crown that forms when baking. Cut the sides so they angle from front to back similar to the pattern. I started behind the nose to cover the cake with fondant. Cover the front of the nose with another piece of fondant. Make a fat rope of fondant to go around behind the nose. The propeller is made from poster board. Attach by pushing a long straight pin through a Junior Mint into the cake. 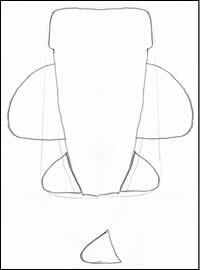 It took four trials to get the airplane right. I doubt I’ll ever make this cake again. 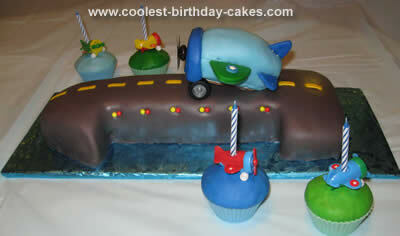 It would be very gratifying to know someone else put all our work to good use from looking at our cake pictures. 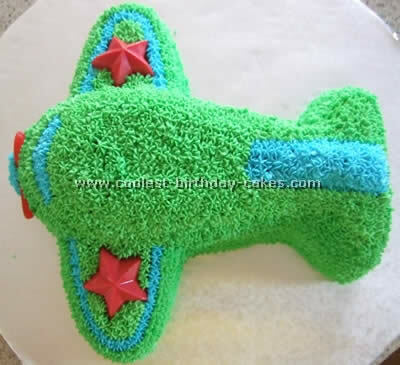 My husband is a pilot so thought it a good idea to make my son an airplane cake for his first birthday. I wanted to do cupcakes since they’re easier for little fingers to hold so I came up with the idea of the cupcake clouds with the airplane overhead. 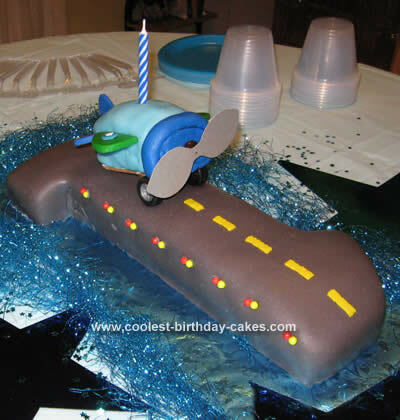 The plane is made of marzipan (found in the cake/hobby section at Wal-Mart) and copied from other cake pictures I have seen. I wanted my son’s cupcake to be unique so I made his look like a thundercloud and made a lightning bolt out of some of the leftover marzipan. I am no expert at cake decorating so the marzipan is really too thick but it was the only way I could manipulate it without ruining the cake. I simply cut the cake freehand out of a 10" cake pan and cut an extra square piece to serve as the piece on the back tailfin. I then placed it on a 10" round cake board (also found at Wal-Mart). 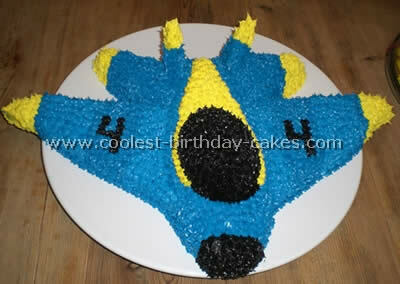 I used the same technique that the other Blue Angel cake on this site used but to make the cockpit and tail wings I made sugar cookies. 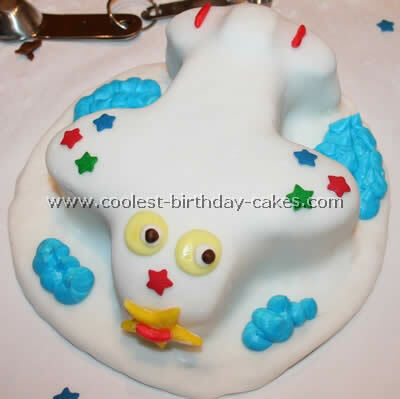 As you can see from my cake pictures, the tail wings were simply triangle cutouts and the cockpit I made by baking the cooking on the backside of an egg cake pan. 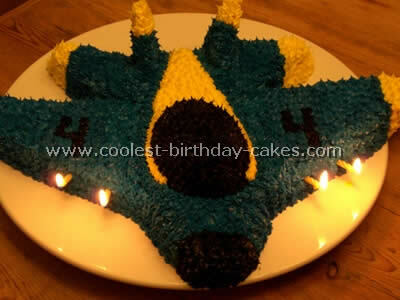 It worked great except like the other poster said, be sure to try and add the cockpit and tail wings last because the icing softens them up and they will get very fragile. We put the candles in the front of the plane sticking out of the wings like "guns" and made it the number 4 plane for the 4th birthday. My 4 year old loved it!